The battle over Google’s plan to build a campus in downtown San Jose has a new flashpoint: a condo formerly owned by the mayor’s wife. Now it's the subject of a debate about whether or not Mayor Sam Liccardo should have been involved in the vote on Google’s future in San Jose. 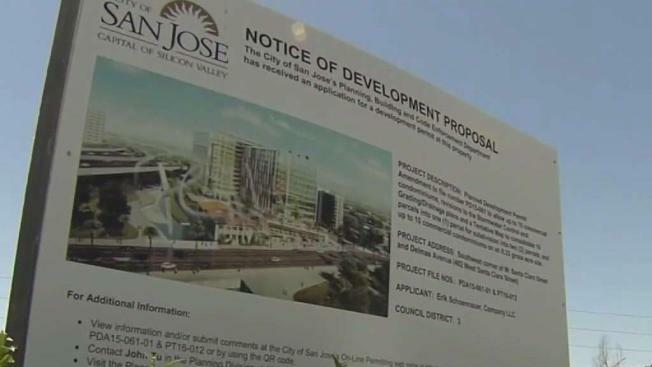 Those opposed to Google's planned development in the downtown area say the mayor is compromised by the money he and his family made from the sale of a condominium at 144 Third St. once owned by Liccardo's wife, Jessica Garcia-Kohl. Liccardo says he made the proper disclosures and did not violate the law. The president of Santa Clara County’s Affordable Housing Network says property values in the area have gone up because of Google's planned 6.8 million-square-foot campus. And the mayor therefore faces a conflict of interest. But Liccardo says he followed the law when it comes to the condo and denies a conflict of interest. "Well, this is pretty old news," he said Wednesday. "I disclosed publicly that my wife owned a condo in downtown a year ago. That was 10 months before the council took any vote on the sale of the land to Google." Liccardo also pointed out that, according to San Jose’s city attorney, a property has to be within 500 feet of the proposed plan for there to be a conflict. "In this case, the proposed development is a mile away from the condo," he said. "It would not be a conflict under the law." Sandy Perry, president of the Affordable Housing Network said: "I know the city attorney may say it’s legal. Well, it may be legal, but it’s not right." San Jose leaders agreed in December to sell the land near the Diridon Station to Google. Liccardo said the condo was sold nine months earlier.